On a Sunday morning we all gather together in church. 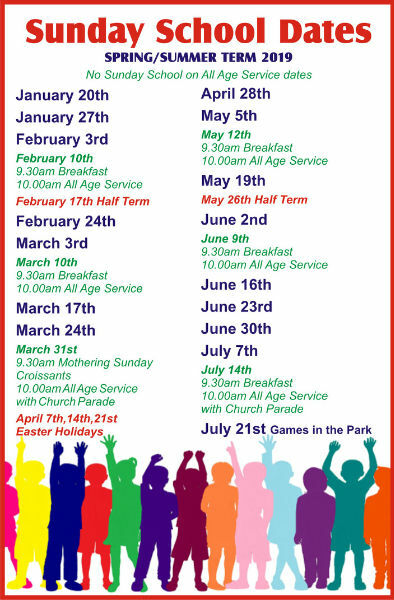 On the second Sunday of every month we all stay in church for an all-age service. Sometimes we welcome our uniformed organisations to these services. On the other Sundays during term-time we have a short children's talk before Sunday School goes out to the hall. We welcome children from 3yrs - 9yrs at Sunday School and 10 -13 yrs in our Young Explorers group. There is a children's corner at the back of church for all our very young visitors. All of our Sunday Schools leaders and assistants are DBS cleared.